The Grab-O-Matic range of SC10 Fork Truck Attachment Drum Rotators, are for the lifting and rotating of drums to dispense the contents in a controlled manner. The standard SC10 is for steel 205/210L drums which are clamped in a full steel hoop with hinged arms and an adjustable over-centre clamp with locking pin. Plastic drums can also be used in the standard unit but a safety adaptor is available as an additional clamping aid. A webbing & ratchet clamping system is an alternative to the steel hoop and is recommended if the majority of drums to be used are plastic. For high level dispensing a chain wheel & chain option is available. In addition to standard drum rotators, crane slung overhead models are available, as are stainless steel and ATEX units for use in spark proof areas. Standard fork attachments have a 500kg capacity. Heavy-duty models with a capacity of up to 1,000kg capacity can also be specified, along with bespoke units for non standard size drums or vessels. 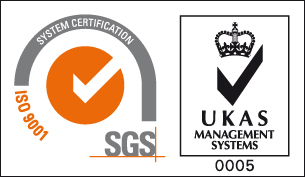 If fork trucks or cranes are not allowed in an area, a reduced size SC10 can be fitted to a range of pedestrian stackers (powered or manual), to allow drums to be dispensed in restricted space areas. This is known as our model range SC22. 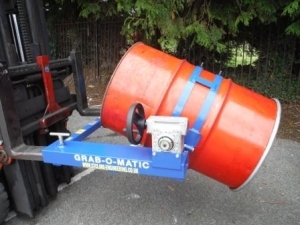 With secure clamping systems and gearbox rotation for controlled dispensing, the Grab-O-Matic SC10 range of drum rotators is a safe and efficient way to transfer the contents of a drum. Since 1959 St Clare Engineering Ltd has manufactured a range of Fork Truck Attachments under the Grab-O-Matic trade name, and since 1979 a small Medical Division manufacturing and supplying Knee Braces. The majority of the Fork Truck Attachments deal with the lifting, moving and tilting drums of steel, plastic or fibre-board construction and of varying shapes, sizes and weights. Exporting more than 45% of production to all parts of the world, St Clare are considered one of the world leaders in drum handling with their Grab-O-Matic range of attachments.